Are you completely happy with your life? Do you wish you could be happier or more successful? Good news – you can! 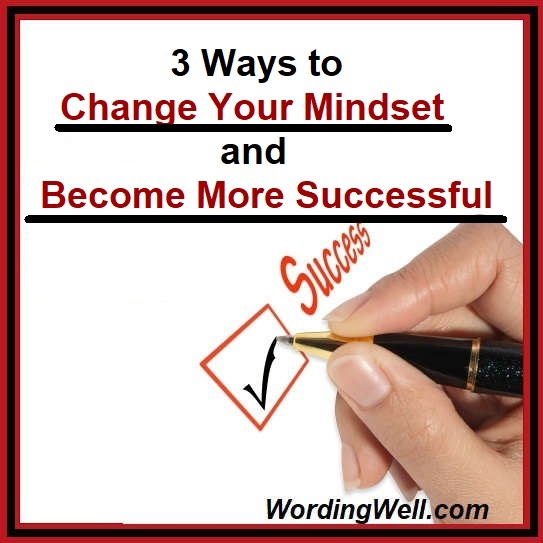 All you have to do is change your mindset and success will be yours! How do I know this? I’m living proof. I used to be a prostitute, a high-school dropout, and a drug addict. But I also went to university for 5 years and became a high school Math and English teacher. Now I am a business owner, a freelance writer and editor, a coach and mentor, and an author! In fact, the first two articles in this series are chapters from my book, From Nope to Hope. You can learn all about me by reading this poem about my life journey and you can learn all about my book by reading the book release of From Nope to Hope. You can also dive right in and learn how to change your mindset and become more successful today! Let’s look at each of these ways in-depth now. I’ll be sharing my personal experiences with each of these ways, too, to prove they work! Because this is the 3rd post in a 3-part series, I’ll simply recap the first two ways, and then get into today’s topic of discussing how to conquer your fears. Meditation, the Law of Attraction, and visualization are three techniques you can use to improve your mindset and become more successful. This is the second article in a 3-part series of things you can do to improve your life and increase your success. Decrease Your Stress and Grow Your Success by using Meditation, the Law of Attraction, and visualization! Entrepreneurs can get extremely stressed. When this happens, it can affect their success. When you are feeling stressed, you generally have many thoughts racing through your mind. To slow down this activity and re-focus your thoughts, you can practice meditation. Meditation will allow you to change your thoughts so that you can put the Law of Attraction into effect in a more positive way. These two things will also help you employ the visualization technique, which will definitely cause your life to improve! Your stress level will decrease, your thoughts will become clearer, and you will be able to cope with anything life throws your way! We have already learned how to use positive affirmations to change our mindset.